Who I am? For what I am? What is purpose of my Life? Whether these questions also comes in your mind ? Do want to find the answers? comes the shelter of Yog and you will be able to find yourself. Yoga Teacher Training is a 28 days program which goes on in Rishikesh on the bank of river Ganga in foothill of Himalya. 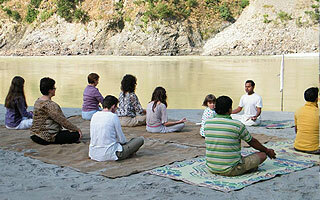 Rishikesh is a small religious town and house of several saints and international Yoga capital. This program could prove as a life transforming program for you. Moreover if you want to take Yoga as a career then this is for you only as you will be awarded by an international certification after the completion of this course. Life becomes more hectic and busy in present era. Yes...Life is unpredictable and changes frequently. Every individual loves to live healthy life. I-order to refresh mind and relax; people travel from their home to some destinations as holiday with their near and dear ones. Rishikesh is one of the locations in India overflow with scenic beauty and nature shines in its true colour. In the state organize 200 Hours Residential Hatha Yoga Teacher Training Program which will give a lifetime opportunity to stay healthy and fit life. The programme is registered under Yoga Alliance International. In present society, most of the people talk about Yoga and it is the time to understand the meaning and benefits of Yoga thoroughly. YOGA is the art which offers a way to live life in a healthy way. It offers physical and mental exercises to live healthy life. This 200 Hours Teacher's Training Program of 4 Weeks offers a golden chance in your entire life. If you are interested in the field and looking for long journey then you must participated the programme. The entire programme is perfectly planned and managed to provide best of the best education and services. The programme is eligible to teach Yoga in any part of the country as well as in whole world. Make sure to register your name as early as possible because the programme is a golden chance and assure that you will go to new direction of your life. It also offers to become a registered Yoga Teacher - RYT 200. The entire programme will teach many yogic science activities through theory and practical. Yoga follows a tradition that will enrich your personal life and also show you how to help others to enrich their lives too. Activities of Yoga follow a unique tradition that will surely enrich your personal life as well as help others to enrich their lives too. Here describing about the course. The duration of course is 4 Weeks. Course fees - USD 1450. The course fees included registration charge. Registration fees - USD 350. The registration fee is non-refundable and the rest fee for the training needs to be cleared on arrival. Local sightseeing facility is not covered in the course fee. Other personal expenditures are not covered. Transport fee is not covered. Normally, New Delhi Airport to Rishikesh or Rishikesh to New Delhi Airport by Taxi is US$ 90 (One way). Journey from Delhi to Rishikesh is 06 Hours drive. •	The medium of instruction is English so you should have capability to Speak, Read and Write English. •	Applicant age should be between 18-60 years at the time of admission. •	Applicant need to provide Medical Certificate if you they have any health problems. All the fees are non-refundable. Students who want to change one course to another should request at least 20 Days before the start of that course. Decision by the authority is last and final. If you are foreign visitor then you must arrange tourist visa and other travel related documents as well as services like travel and health insurance must be arranged as early as possible before leaving your own country.